With the holiday season here, many of you may be taking baby on their first flight. This is definitely an exciting time that will need to go down in their baby book…with pictures of course! Amid all the excitement, the thought of keeping your baby on your lap in mid-air for a few hours without squirming is enough to make you look for the nearest emergency exit. If your baby is under two, you’re not required by law to buy them their own seat. So, it’s really up to you how you want to travel. Either way, parenting on land is hard enough. Throw an airplane into the mix and you never know what you’re going to get. 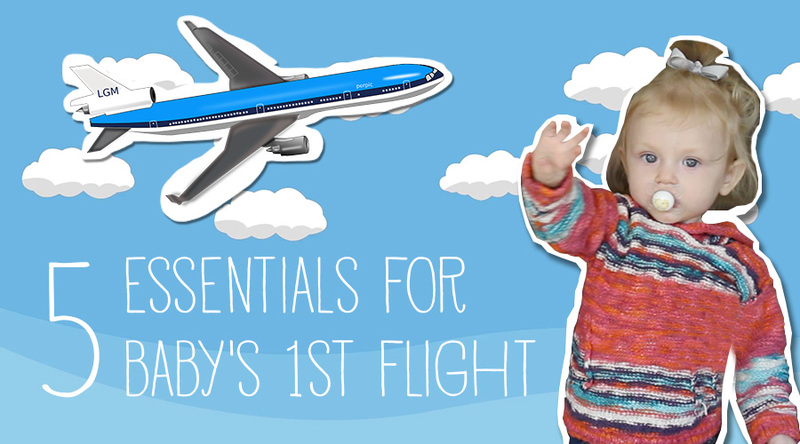 Luckily, there are some things you can bring along to avoid any turbulence…at least not any caused by your baby! 1) Bottles, extra formula or milk. Sure your flight is supposed to take-off at 3, but guess what? There’s a two-hour delay and now you may run out of formula because you banked on being at Grandma’s house in enough time for the next feeding. Don’t get caught like this. Expect the unexpected when flying and bring along enough breast milk or formula. It’s not like you can ask for an extra bag of pretzels to hold your baby over until you land. 2) Diapers, diapers, and more diapers…oh and a scented trash bag. Where do you stop for diapers at 30,000 feet in the air? You don’t. That’s why you need to bring along more than you’ll ever need. It may sound a bit ridiculous, but do you really want to deal with the alternative? On that note, bringing along a scented bag to dispose of the dirty diapers before throwing them in the airplane garbage will definitely earn some brownie points with the flight attendants. 3) Favorite toy and/or lovie. If your little one has a favorite toy or stuffed animal, be sure to bring it along. The lovey can make falling asleep on the plane easier and calm any fears while his favorite toy can help pass the time. If you’re lucky, your baby will sleep most of the flight! If not that toy will come in handy; so will walking up and down the aisle. Babies love to explore! What’s more exciting than an airplane filled with new faces? This kind of goes along with #1, but having snacks and squeezy pouches helped keep her occupied while also keeping the hunger at bay. We gave our daughter Puffs as well in a spill-proof (to an extent) container which she loves. This has kept her busy time and time again. Our daughter doesn’t use a binky very often (we say that as she has one in the picture lol), but in truth she doesn’t. She can take it or leave it. HOWEVER, giving it to her on our flights was a life saver. It kept her from having any kind of ear popping or pains. It was awesome and we highly recommend it! Baby’s first flight doesn’t need to be a major stressor. Make it fun and stay positive; remember babies feed off their parents’ energy. Bring along these essentials and you may have such a smooth flight that you’ll be booking your next trip in no time!